This unusual name is of Anglo-Saxon origin, and is a locational surname from a place that is now 'lost', and has disappeared from the maps. Betweeen seven and ten thousand villages and hamlets in Great Britain are known to have been lost since the 11th Century, due to such causes as the enforced clearing of villages to make way for sheep pasture in the 14th Century, and natural disasters such as the 'Black Death' of 1328. 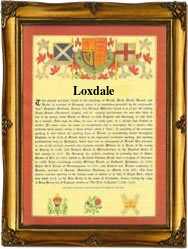 The name Loxdale is derived from the Olde English pre 7th Century personal name 'Locc', with 'dael', meaning dale or valley. The places called Loxley in Staffordshire and Warwickshire mean 'Locc's wood or glade' from 'Locc' as before and 'leah', wood or clearing. The marriage between Thomas Loxdale and Elizabeth Rowlands was recorded at St. Chad's, Shrewsbury in Shropshire, on the 31st March 1672. The first recorded spelling of the family name is shown to be that of Peter Loxdall, christened, which was dated 8th July 1649, St. Peter's, Wolverhampton, Staffordshire, during the reign of Oliver Cromwell, The Great Protector, 1649 - 1658. Surnames became necessary when governments introduced personal taxation. In England this was known as Poll Tax. Throughout the centuries, surnames in every country have continued to "develop" often leading to astonishing variants of the original spelling.